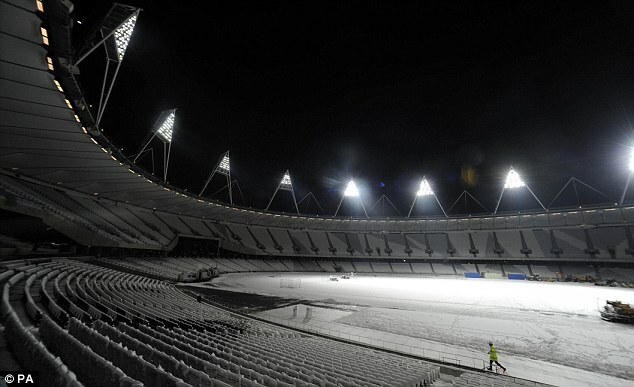 David Cameron marked a historic moment for Britain last night when he turned on the lights at London's 2012 Olympic Stadium for the first time. 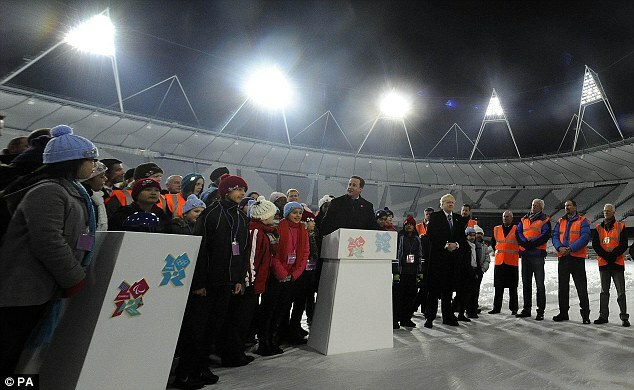 The Prime Minister, flanked by London Mayor Boris Johnson and Games organising chief Lord Coe, pushed the button to switch on the floodlights during a special ceremony at the snow-covered stadium. 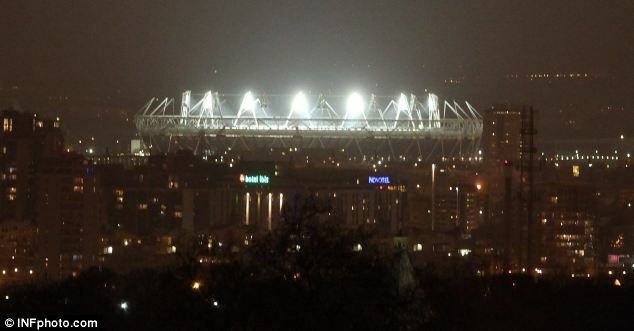 It was the first time that all 532 bulbs had been lit together - in a scene that will be repeated during the 2012 Games. 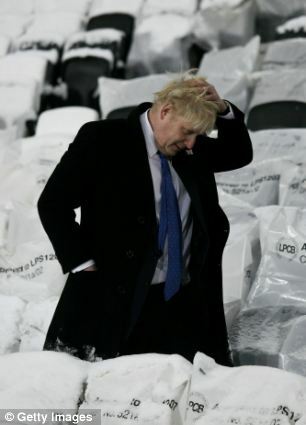 Mr Cameron joked that the £537million stadium in Stratford, east London, looked more like a winter Olympic venue with ski-jumper Eddie the Eagle expected at any moment rather than the setting for the London 2012 summer Games. But he told the 400-strong invited crowd, which included 2012 builders and a choir of local schoolchildren, at the site that 'the biggest show on earth' will be coming to east London in one year, seven months and seven days. 'It is being delivered on time and on budget thanks to British genius and many of the people here,' he added. Introductions were carried out by Mr Johnson, who did not seem aware that the lights take up to eight minutes to reach full power. 'They are coming, they are coming,' he told the crowd before all the lights had phased in. 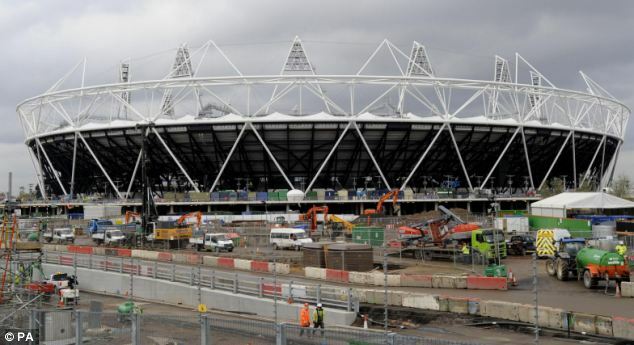 He described it as a 'wonderful and historic evening', while also joking that with plans so advanced, including 75 per cent of building work complete, London 2012 might consider holding a snap Olympics now 17 months before the Games 'to catch the world napping'. There are 14 lighting towers reaching 70m (230ft) above the sports area. 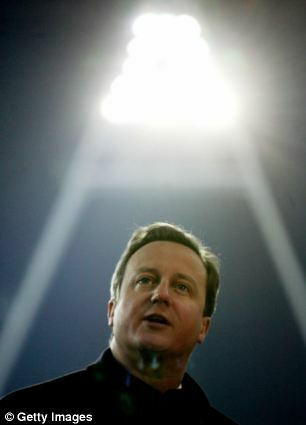 Mr Cameron also spoke of changes to unpopular plans to cut £162million from school sport. Earlier, the Education Department announced it will fund School Sport Partnerships to the end of the summer term 2011 at a cost of £47million, ensuring they can run until the end of the academic year. A further £65million has been earmarked to enable every secondary school to release one PE teacher for a day a week in the school year 2011-12 and in 2012-13. This recognises the considerable impact the current network of School Sport Co-ordinators have had on PE and school sport throughout the country over the past decade. The Department also announced it will fund the Youth Sport Trust (YST) to expand its Young Ambassadors programme so that every secondary school and some primary schools can create more Young Ambassadors ahead of London 2012. The Government also restated its commitment to a nationwide school sport competition.